The natural landscapes of the Almeria supply the foundation for horseback riding in the province and a source of wonderment along the boundless horse riding trails. From the coast to the mountains the ever changing scenery will surprise and delight, take a ride across a secluded beach, or an evening canter in the desert canyons, experience the mountainside tracks, and views, or gallop through the open valleys abundant with almond blossom and orange groves. The allure of the natural parks are enticing in their diversity, from the pine forests of Sierra Maria in the north of the province, to the volcanic hills of Cabo de Gata by the Mediterranean sea, the vistas really cannot be improved upon but what better way to enjoy them than from horseback. There are numerous horse riding stables and horse riding centres in Ameria province and between them practically every conceivable equestrian service is covered, from single treks to full riding schedules, livery services, riding lessons for beginners and opportunities for improvement for the more experienced rider. The horse riding centres of Almeria have their own dedicated websites which provide comprehensive details of their quality horses, unique riding routes and other equestrian services. Below I have compiled a list of each of the stables giving a brief description of their services and location with the link to their website. 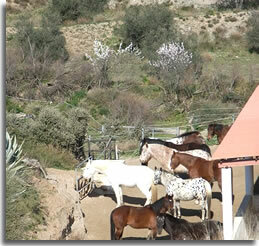 Many of the stables and horse riding centres offer horse riding holidays in Almeria, with options for accommodation. The list is compiled by destination, followed by the name of the stable/s. Horse Riding holidays* are available or can be arranged from the highlighted stables. The southern foothills of the Sierra de las Estancias mountain range, in the Almanzora region of Almeria, is the setting for this family run stables. The ranch sits at six hundred metres above sea level in ten acres of unspoilt Andalucian countryside on the outskirts of the whitewashed village of Partaloa. The breathtaking mountainous terrain offers endless trekking opportunities. Services from the riding centre include horse riding lessons, livery, tailor made riding holidays, and the privileged option to take a horse on loan for a specific time period. Ranch Luz del Sol on FACEBOOK, available in English. Riding Holidays at Ranch Luz del Sol website available in English. The reformed Cortijo el Sotillo Hotel and riding stables holds a prime position at the entrance to the fishing village and tourist resort of San Jose in the heart of the Cabo de Gata Natural Park. Perfectly located for both inland and coastal trails, the equestrian centre offers several horse riding routes which include Monsul beach, Genoveses beach and the countryside around the traditional village of Pozo de los Frailes. Cortijo El Sotillo website, available in English. Approximately two kilometres from Agua Amarga village and the Mediterranean sea, this riding centre, in collaboration with Finca Los Tigres, a traditionally styled Andalucian farmhouse, specialises in horse riding adventure holidays in the unforgettable landscapes of the Cabo de Gata Natural Park. There are a variety of horses, suitable for every level of rider, from newcomers to the fully trained, with a selection of small ponies and donkeys for children to ride. 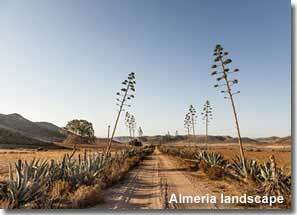 Finca Los Tigres website, available in English, with details of Hipica Agua Amarga. 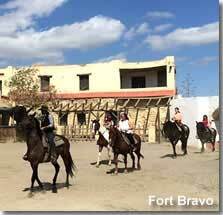 The Fort Bravo western village and film set, based in the Tabernas desert, presents horseback riding adventures and the chance to live out a wild west cowboy fantasy within the desert landscapes, with trail options suitable for riders of any level including those with no riding experience. Fort Bravo - Tabernas horse riding routes, website, available in English. Similar to Fort Bravo, the Western Leone themed village in Tabernas also provides horseback riding routes both within the western village area and out in the desert landscapes. Western Leone - Tabernas horse riding trails, website, available in English. This Spanish run equestrian centre excels in its services offering professional horse riding exhibitions for special occasions and the hire of horse drawn carriages. There are organised horse riding classes for various skill levels and a pony club for children. The centre introduces two contrasting routes for guided horseback riding, a valley trek that takes the trail of the Rio Aguas with vistas to the Sierra Cabrera and the hillside village of Mojacar pueblo, or a coastal ride along the splendid sands of Vera beach. 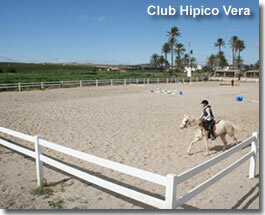 Club Hipico - Vera website, available in Spanish only. Located directly beside the Cueva del Lobo beach, over looking the Mediterranean sea, in the beach resort of Mojacar. This established centre has been bringing certified equestrian instruction to both locals and visitors for many years. Dog behavioral training is also provided. Cueva del Lobo website, available in English. This established centre is run from an old farmhouse just twenty minutes inland from Almeria city and the beach resort of Roquetas de Mar and is set at the foot of the southern slopes of the Sierra Gador mountain range. The centre is devoted to the breeding of the Spanish Pure Breed Horse. Horse riding lessons include the Doma Clasica and Doma Vaquera Spanish style of training with bilingual teachers. Horseback riding routes are available for both competent and novice riders, the guided ventures include a pathway from Vicar to the Almeriense Alpujarra, in the northern Gador foothills, and a beach trail. Cortijo Blanco website, available in English.